Why Do Some People Like Spicy Food While Others Can’t Stand It? I love spicy food. I put red chili flakes on almost everything I eat and when I eat out I almost always ask for the dish to be extra spicy (if it’s a dish that’s supposed to be spicy of course). My friend in high school though hated spicy food. She thought even the mildest food was spicy; she thought that the chicken at Chipotle was spicy, and I still don’t know how. I couldn’t understand how she could think such a mild flavored food was so torturous while I was loving the burning sensation of the spiciest hot sauce. So I began to wonder, why do some people love eating spicy food while others can’t stand the spice? This observational study looked at the mechanisms behind people’s enjoyment of spicy foods and found that increased exposure to chilies in food led people to begin liking the spice of the food. It’s not that people who like spicy food don’t feel the spiciness of that food, but they grow to enjoy that feeling. The researchers believe that this change could be because of relations of the food with positive experiences, including enhanced flavor of food or rewards. 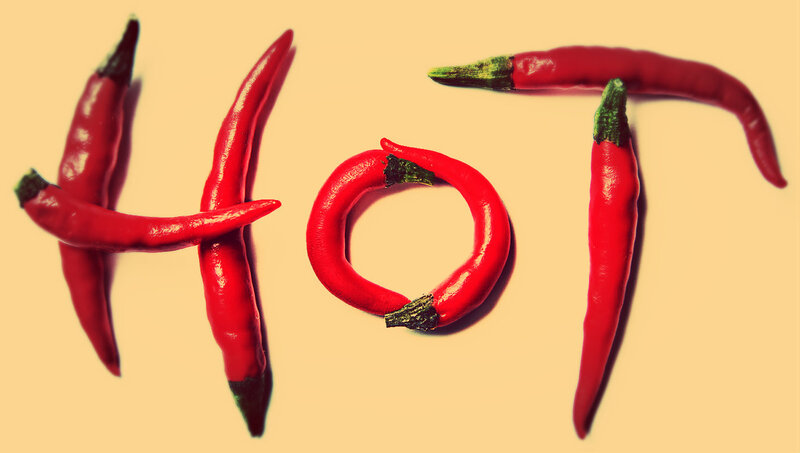 The scientists also hypothesized that maybe our initial dislike of chilies is to warn us of the heat, but the pleasure that some feel while eating spicy foods may be a result of enjoying a food that the body has deemed potentially harmful. The enjoyment and consumption of spicy foods may also be a form of thrill seeking. Unfortunately, I was unable to find the methods and procedure behind this study, so I am unable to assess it based on any criteria, but I found the abstract to be rather interesting and informative of some of the possibilities of why people enjoy spicy foods. While looking for other possible factors at play, I found this study that used twins from Finland—47 monozygotic and 93 dizygotic twins plus 51 twins without the other twin—to look at how genetics influence our enjoyment of spicy foods. They had the subjects eat strawberry jelly with and without capsaicin and then rate how pleasant and pungent the food was. Based on their answers, the subjects were then divided into three groups—non-likers, medium-likers, and likers. They found that genetics accounted for 18-58% of the variation in how the subjects rated the pleasantness of spicy foods, and the sensations they feel when consuming the food. How pleasant one found the spicy food was correlated with the shared genes. Based on these results, the researchers felt that genetics play a role in the enjoyment of spicy foods. This could explain why both my dad and myself love those extra hot meals. The study, however was relatively small and relied heavily on self-evaluations of responses to spicy food, which is not the most accurate form of data collection. But it definitely offers an interesting explanation as to why some people prefer spicy food, although the exact genes that may be at play and why only some people have the gene for preference of spicy food is not known. Personality differences is also an explanation as to why some people show a stronger affinity toward spicy food. This study looked at the relation between personality, which they defined in terms of body awareness/consciousness, sensation seeking, sensitivity to punishment, and sensitivity to reward and the enjoyment of food with capsaicin (spicy foods). They found a strong relation between people enjoying spicy food and how frequently they consumed said food, which is not at all surprising. But they did not find an association between how often one ate spicy food and the perception of the burning of that spicy food. I find this hard to believe because of my own experiences. I feel like the more I eat spicy foods, the spicier foods I’m able to consume. In an article in The Atlantic, John Hayes, director of the Sensory Evaluation Center at this very university, stated that desensitization plays a role in the enjoyment of spicy foods. To allow yourself to enjoy spicy foods more, you must consume them more to get your body used to the feeling, after which your body will crave more of that spicy heat. TRPV1, a pain receptor in our bodies, regulates the feeling that comes when we consume capsaicin. Capsaicin lowers the amount of energy that causes these receptors to activate, which makes your body and mind react as though your mouth is on fire when in reality you’re really doing just fine. So, although there was no evidence found in this study that the perception of how spicy something is changes with the frequency of consumption, my experiences and the words of John Hayes makes me question that. But the study also found that personality traits did not correlate with the perceived burning of spicy food. Sensation seeking, however, was positively correlated with how much people enjoyed spicy food. And sensitivity to reward was slightly associated with the liking of spicy food as well. How often one ate spicy food was also associated with people who are sensation seeking and sensitive to reward. This thrill seeking mentality could be part of why people feel the need to consume spicier and spicier foods. Maybe those people enjoy extreme sensations, or maybe they enjoy being able to declare their strength in terms of the amount of spice that they can handle. Either way, it’s an interesting finding that I hadn’t thought about before. Another study looked at gender differences in the liking of spicy food in relation to personality traits and found that sensitivity to reward was more associated with the liking of spicy food in men and sensation seeking was more associated with the liking of spicy food in women. The researchers hypothesized that men may enjoy spicy foods because of external factors while women may enjoy spicy food because of more intrinsic factors. The subjects were actually from Penn State, which is very cool, and there were 246 participants between the ages of 18 and 45. They accounted for many confounding variables such as pregnancy, defective taste or smell, the taking of prescription pain medications, and race and ethnicity. The data however was self-reported, which always may lead to some bias. I have found my male friends to enjoy spice more than my female friends, so this study definitely holds up with my own experiences. And another study found that men with more testosterone added more hot sauce to their mashed potatoes, but not more salt, further supporting that gender may be a predictor of how much one enjoys spice. Overall, it seems like there are many factors that may be at play here. But, if you’re female, or not adventurous, don’t think that you’re incapable of enjoying some good spicy food. Instead, see where your own personal threshold is, and maybe after consuming spicy food more frequently you will be able to increase your own tolerance and eat that extra fiery hot sauce your friends have been raving about. And if you don’t care about being able to tolerate that spice, then just keep on avoiding those spicy foods, that way they can’t hurt you. This entry was posted in Uncategorized on October 20, 2016 by Rebecca Aronow. I really liked this blog! I love spicy food, but sometimes I find myself craving it more than I normally do. Seriously, nothing is spicy enough. So, I found this article that talks about possible reasons why someone would have a craving for spice.